As a condition of using this website, you agree with Gokul Sweets. Your use of this website constitutes your acceptance of these Terms and your acknowledgement that you are bound by these Terms. These Terms may be modified or terminated by us at any time. Continued use of this website by you will constitute your acceptance of any modification or the termination of these Terms. If you do not agree with these Terms, please do not use this website. Further, you may not place on this website any material that violates and laws or regulations, is encrypted, constitutes junk mail or unauthorized advertising, invades anyone’s privacy or encourages conduct that would constitute a criminal offence or give rise to civil liability. You agree and acknowledge that your failure to comply with these Terms may subject you to civil and criminal liability. This website contains Content that is owned or licensed to us and/or our related entities which is subject to copyright, trademarks and other proprietary and intellectual property rights. Such Content includes, but is not limited to text, icons, photographs, logos, product names, entity names (including company and business names), source code, graphics and the design/layout of website. 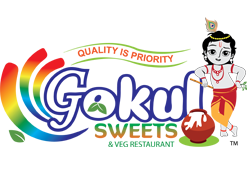 If you have any questions or queries regarding the use of this website or these Terms, please feel free to contact our Customer Service Team at info@gokulsweets.com.